John Pistole, the head of the Transportation Security Administration, announced yesterday that full body scanners at airports across the nation will be seamlessly integrated with Facebook next month, allowing travelers to save, tag, and share their near-naked security photos with friends, family, and co-workers through the popular social networking site. 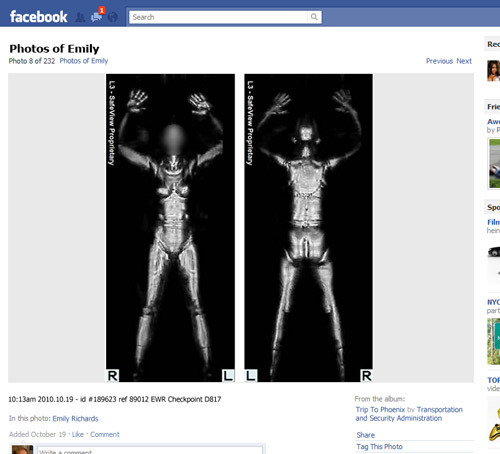 Immediately after being subjected to a scan, the traveler’s photo will be automatically uploaded to a public album on Facebook and tagged accordingly. According to Pistole, this cutting-edge integration will allow travelers to stay more connected than ever with their social networks, letting Facebook users know when their friends have made it through airport security and if they are smuggling weapons in their rectums in real time. Foursquare integration is rumored to be rolled out in 2011.